Samsung NP-R530 15.6 Laptop Intel Pentium Dual Core T4400 2.2GHz 2Gb, 320Gb Red. Condition is Used but very good. Comes loaded with Microsoft Office Word, Excel, Outlook, Callendar & PowerPoint 2007. Charger Cable included. Pentium T4400 Duo Core processor. T4400 Duo Core Processor. R530 Laptop. 250gb Sanatized. Samsung Laptop. 1 x Samsung Laptop. In perfect Used Working Condition. Processor Pentium Dual Core T4400 2.20 GHz. Samsung R530. Product Family R530. Model R530. Storage 1TB HDD. Make Samsung. Used, fully working device. The laptop has a faulty battery. Samsung R530. Product Family R530. Model R530. Storage 1TB HDD. Make Samsung. We will only use your data to provide the requested service. We will only share your data with 3rd parties to ensure the execution of this service. RAM: 3GB DDR3 RAM. Hard Drive: 160GB HDD. Anyone who enjoys movies and HD video content will appreciate the enhanced visual quality of the pure 16:9 aspect ratio LED display. The R530 is ideal if you want to get things done in style. Samsung R530. WXGA HD 1366 x 768. Ecran Panel Display Screen. Slab LED 15.6". expédition de France. Need to change the hard drive?. Caddie - Rack. Dépôt Espèces (dans n’importe quelle agence BNP Paribas). Keyboard Genuine Samsung R530 9z. n5lsn.00f Azerty New in France. ORIGINAL Samsung R530 keyboard. R530 Series. Numéro de pièce fabricant 9Z. Need a QWERTY keyboard?. Need to change the hard drive?. Optical Drive. Samsung P28. Samsung Q1U - Y02. Samsung R50 2000. Samsung X 50 XWM 750. Samsung X 50 XWM 740. Samsung X 50 XVM 1600. Samsung X 50 XEP 760. Samsung X 50 WVM 2130. Samsung Q1U - Y02. Samsung VM8100 series. Samsung R50 2000. Samsung X 50 XWM 750. Samsung X 50 XWM 740. Samsung X 50 XVM 1600. Samsung X 50 XEP 760. Samsung X 50 WVM 2130. Hard Drive Capacity: 240 GB SSD Colour: Red. Custom Bundle: No Model: Samsung R530-JB01UK. The keyboard is lifted on the left side and the U key is loose. The palmrest is cracked on the bottom left corner. The HDD cover and two of the rubber feet are missing. No further testing done. See pictures for details. this laptop is for spare or repairs. Liquid damage ,, No Hdd NO Ram No LCD No charger Battery is not tested. 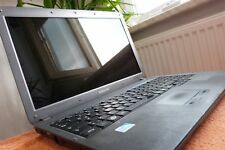 Laptops hinges and frame is ok .fan grill missing ..
Notebook Laptop Samsung NP-R530 320GB HDD 4GB RAM Win10 15,6 Zoll Office 13 Top! Refurbished! all Windows updates! Battery NEW! i3! Dealer | Bill | FREE DHL shipment. Refurbished! all Windows updates! Extra Battery! i3! Hello, Up for sale is Nice Samsung R530 Red Laptop with Cam. WEBCAM SCB-0350M WITH MANYCAM WORKS GREAT. SAMSUNG TS-L633C DVD BURNER. SAMSUNG R530/U2E1 MOTHERBOARD. 19V 65WATT SAMSUNG NON OEM ADAPTER-NEW. Biete hier das abgebildete Notebook. Visuelle : l ’objet est en très bon état physique ne présente aucun défaut particulier à signaler. Nous traitons et expédions votre commande dans les 24 heures. Une facture est jointe à la commande. Nous nous efforçons de vous servir aux mieux. Une facture est jointe à la commande. Visuelle : l ’objet est en très bon état physique ne présente aucun défaut particulier à signaler. CONNECTEUR GRAVEUR DVD BON ETAT POUR PC SAMSUNG NOTEBOOK MODELE NP- R530. Nous nous efforçons de vous servir aux mieux. Une facture est jointe à la commande. RAVEUR DVD BON ETAT POUR PC SAMSUNG NOTEBOOK MODELE NP- R530. Nous nous efforçons de vous servir aux mieux. Une facture est jointe à la commande. Nous nous efforçons de vous servir aux mieux. Une facture est jointe à la commande. Samsung R530. WXGA HD 1366 x 768. Ecran Panel Display Screen. Dalle LED 15,6". expédition de France. Dépôt Espèces (dans n’importe quelle agence BNP Paribas). Laptop Parts and Electronic Products Wholesaler, Distributor and Importer. Samsung X05 PRC001. Samsung X05 Series. Samsung X60 Plus TZ03. Samsung X60 Plus TZ01. Samsung X60 Plus Series. Samsung X50 XWM 750. Samsung X50 XWM 740. Samsung X50 XVM 1600. Clavier D'ORIGINE Samsung R530. R530 Séries. Besoin d'un clavier AZERTY ?. expédition de France. Caddie - Rack. Dépôt Espèces (dans n’importe quelle agence BNP Paribas). Disque Dur. Laptop Parts and Electronic Products Wholesaler, Distributor and Importer. Affichage LED. -Résolution : 1366 768 pixels. -Type de rétroéclairage : LED. MPN Non applicabile. Créé parTurbo Lister. NOUS GARANTISSONS QUE NOUS ALLONS TROUVER UNE SOLUTION SATISFAISANTE !! REÇU OU UNE FACTURE. Samsung X05 Plus. Samsung Q25 1600 Byron. Samsung X60 Plus TZ03. Samsung X60 Plus TZ01. Samsung X60 Plus Series. Samsung X50 XWM 750. Samsung X50 XWM 740. Samsung X50 XVM 1600. Ventola CPU Fan per notebook Samsung. Vi garantiamo che troveremo una soluzione soddisfacente ! Scontrino o fattura Condizione essenziale per l'esercizio del diritto di recesso è la restituzione in buono stato di conservazione dei prodotti acquistati. A quality laptop can help owners with a series of functions for both home and work. The Samsung r530 laptop is powerful and has a variety of features to help you simplify your life. Check out the following questions about this Samsung laptop before shopping for one on eBay. What hard drive sizes are available? The hard drive is the part of the computer responsible for storage. Depending on its size, it can store all of your media and document files in one easy-to-access place. Of course, the bigger your hard drive, the more information you can store. In some cases, you can upgrade a hard drive down the road if you outgrow its needs. Here are some of the available hard drive sizes for the Samsung r530 laptop on eBay. What operating system does it come with? The Samsung r530 laptop is a PC laptop, meaning it runs on Windows software. While it can be upgraded, most of the models sold on eBay come with Windows 10 installed. Before purchasing make sure that the version of the operating system it uses can run all of the software you need. What are some of the features of the laptop? Built-in microphone and camera - Use the built-in microphone and webcam to use Skype or any other video messaging service you desire. The microphone is most effective if you are wearing headphones. Backlit - The LED screen is backlit, which means that you can use it in dark rooms or at night. The brightness can be adjusted to taste. Built-in speakers - Stream and listen to music online straight from the laptop using the built-in stereo speakers on each side. Touchpad - There is no need for an external mouse thanks to the trackpad just below the keyboard. This helps keep the device compact and portable. HDMI port - Run video from the laptop to your television in high-quality thanks to the HDMI output on the Samsung r530. Are there USB ports available? Yes. The laptop has three available USB 2.0 ports. This allows you to connect a variety of different devices to the laptop like mobile phones, tablets, music keyboards, and more. Before using the device, be sure the proper drivers are installed to the USB drive.